She worked for many years in famous hotels across different countries and she loves travelling and discovering new cultures and people ! She is graduated from the ”Ecole Hotelière de Paris” and the ”Institut Paul Bocuse school” (Hospitality, cooking, wine & service school) and holds a specialized MBA from the prestigious ”Essec Business School” in Paris, France. Most importantly, she is passionate about wine since her childhood and her DREAM is to make wine easy & fun for YOU !! 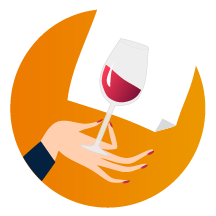 Cecilia provides wine tasting courses, easy & funny, for corporates (team building, customer rewards…) as individuals (wine dinner, party…). Contact us to book your next unique course experience with Cecilia! Here are a few tips to better taste & enjoy your wine better ! Check the best temperature to enjoy your wine with ! If possible get an “INAO” a glass, or any wine glass with tulip shape: a large base and thinner borders on the top will allow you to get a better scent of your wine’s flavors ! Avoid cooking or strong smells, noisy rooms and … BE RELAXED ! Wine tasting comprised 3 steps. As you would for a puzzle, you have to assemble each element to understand your wine. 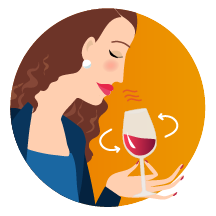 Follow those 3 steps during your wine tasting and do not worry, nothing is complex, it’s just easy & fun ! Take your glass from the down part, tilt it slightly and LOOK, easy & fun ! Tips: use a white napkin or even your white t-shirt to have a better glimpse at the wine’s color. 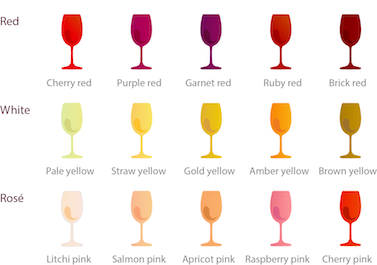 There are many different colors tones, check the range of colors for red, white and rose wines! Color is always darker when the wine is young and lighter when it ages. Tips: Sparking wines also have different colors tones from light to dark. Check the size of the bubbles: the thinner they are, the better the quality is! This is the thin color on the side of the glass edge. For white and rose wine, wine hint becomes darker with age. For red wines, it becomes lighter with age. Is the wine clear, with no pieces of particles inside? This is a sign of quality! Tips: A few particles are ok in old wines, or also organic or non filtered ones. After having tilted your glass a little, if you see transparent traces inside the glass, then you have found the wine “legs” ! It shows mostly the alcohol contained into the wine ! The slower the traces come down, the more alcohol it has. First we tip a little the glass and smell into the glass. You will smell some aromas. Now, swirl slightly your glass counter clock wise and SNIFF, easy & fun ! Tips: An easier way is to swirl directly your glass over the table. Close your eyes, do you recognize some flavors? Congratulations! Tips: Pause for minute, then swirl your glass again : flavors will come to YOU with more intensity ! You can sometimes encounter some a bad smell: rotten egg, cork, gas, sulphur… This often due to a flaw with the bottle… leave it for 10 minutes. Smell it again and if it persists, pick another Easy Bacchus bottle ! At last, open your mouth, sip a bit of wine while letting some oxygen in to better TASTE & ENJOY, easy & fun ! Tips: Breathe to feel the flavors better! 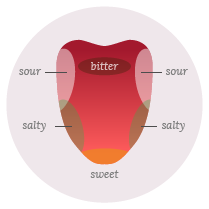 Your tongue is powerful and will enable you to experience different feelings: first sweet, then salt, sour and finally bitter. 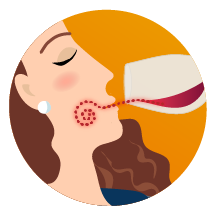 Tips: Make your wine swirl all over your mouth and feel it ! Which taste lasts in your mouth? Are you enjoying your wine? Trust yourself, and do not forget, TASTE & ENJOY, easy and fun ! 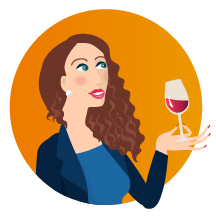 Want to LEARN MORE about wine, easy and fun? FOLLOW US and be part of the Easy Bacchus adventure! We are waiting for YOU, easy and fun !